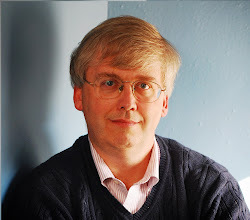 For about 30 years now, my actual paid job (as opposed to my blogging hobby) has been Managing Editor of the Journal of Economic Perspectives. 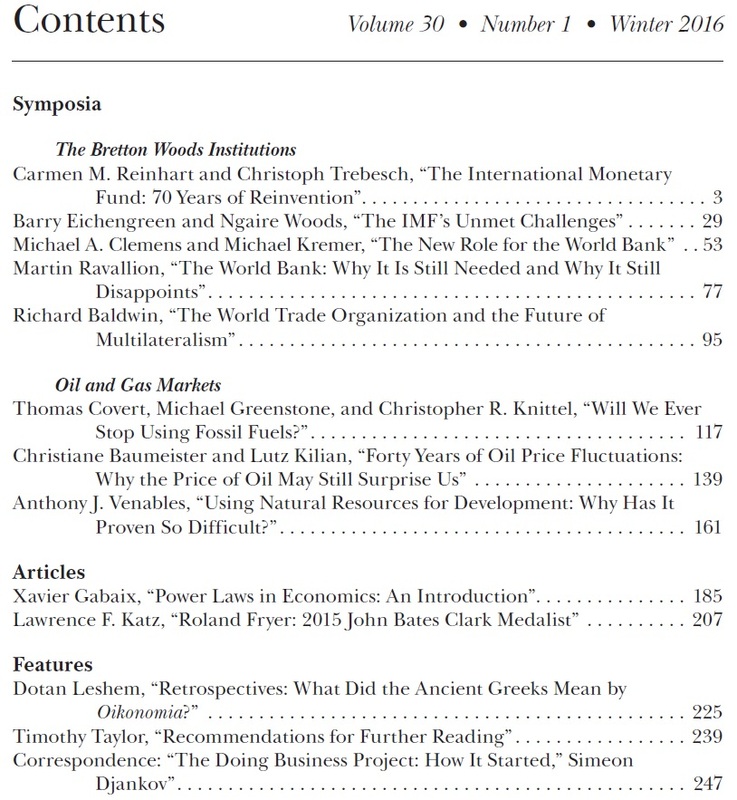 The journal is published by the American Economic Association, which back in 2011 made the decision--much to my delight--that the journal would be freely available on-line, from the current issue back to the first issue in 1987. Here, I'll start with Table of Contents for the just-released Winter 2016 issue. Below are abstracts and direct links for all of the papers. I will almost certainly blog about some of the individual papers in the next week or two, as well. A sketch of the International Monetary Fund's 70-year history reveals an institution that has reinvented itself over time along multiple dimensions. This history is primarily consistent with a "demand driven" theory of institutional change, as the needs of its clients and the type of crisis changed substantially over time. Some deceptively "new" IMF activities are not entirely new. Before emerging market economies dominated IMF programs, advanced economies were its earliest (and largest) clients through the 1970s. While currency problems were the dominant trigger of IMF involvement in the earlier decades, banking crises and sovereign defaults became the key focus after the 1980s. Around this time, the IMF shifted from providing relatively brief (and comparatively modest) balance-of-payments support in the era of fixed exchange rates to coping with more chronic debt sustainability problems that emerged with force in th e developing economies and have now migrated to advanced economies. As a consequence, the IMF has engaged in "serial lending," with programs often spanning decades. Moreover, the institution faces a growing risk of lending into insolvency; this has been most evident in Greece since 2010. We conclude with the observation that the IMF's role as an international lender of last resort is endangered. The International Monetary Fund is a controversial institution whose interventions regularly provoke passionate reactions. We will argue that there is an important role for the IMF in helping to solve information, commitment, and coordination problems with significant implications for the stability of national economies and the international monetary and financial system. In executing these functions, the effectiveness of the IMF, like that of a football referee, depends on whether the players see it as competent and impartial. We will argue that the Fund's perceived competence and impartiality, and hence its effectiveness, are limited by its failure to meet four challenges—concerning the quality of its surveillance (of individual countries, groups of countries, and the global system); the relevance of conditionality in loan contracts; the utility of the Fund's approach to debt problems; and the Fund's failure to adopt a system of governance that gives appropriate voice to different stakeholders. These problems of legitimacy will have to be addressed in order for the IMF to play a more effective role in the 21st century. The World Bank was founded to address what we would today call imperfections in international capital markets. Its founders thought that countries would borrow from the Bank temporarily until they grew enough to borrow commercially. Some critiques and analyses of the Bank are based on the assumption that this continues to be its role. For example, some argue that the growth of private capital flows to the developing world has rendered the Bank irrelevant. However, we will argue that modern analyses should proceed from the premise that the World Bank's central goal is and should be to reduce extreme poverty, and that addressing failures in global capital markets is now of subsidiary importance. In this paper, we discuss what the Bank does: how it spends money, how it influences policy, and how it presents its mission. We argue that the role of the Bank is now best understood as facilitating international agreements to redu ce poverty, and we examine implications of this perspective. Does the World Bank still have an important role to play? How might it fulfill that role? The paper begins with a brief account of how the Bank works. It then argues that, while the Bank is no longer the primary conduit for capital from high-income to low-income countries, it still has an important role in supplying the public good of development knowledge—a role that is no less pressing today than ever. This argument is not a new one. In 1996, the Bank's President at the time, James D. Wolfensohn, laid out a vision for the "knowledge bank," an implicit counterpoint to what can be called the "lending bank." The paper argues that the past rhetoric of the "knowledge bank" has not matched the reality. An institution such as the World Bank—explicitly committed to global poverty reduction—should be more heavily invested in knowing what is needed in its client countries as well as in international coordination. It should be consi stently arguing for well-informed pro-poor policies in its member countries, tailored to the needs of each country, even when such policies are unpopular with the powers-that-be. It should also be using its financial weight, combined with its analytic and convening powers, to support global public goods. In all this, there is a continuing role for lending, but it must be driven by knowledge—both in terms of what gets done and how it is geared to learning. The paper argues that the Bank disappoints in these tasks but that it could perform better. When the General Agreement on Tariffs and Trade was signed by 23 nations in 1947, the goal was to establish a rules-based world trading system and to facilitate mutually advantageous trade liberalization. As the GATT evolved over time and morphed into the World Trade Organization in 1993, both goals have largely been achieved. The WTO presides over a rule-based trading system based on norms that are almost universally accepted and respected by its 163 members. Tariffs today are below 5 percent on most trade, and zero for a very large share of imports. Despite its manifest success, the WTO is widely regarded as suffering from a deep malaise. The main reason is that the latest WTO negotiation, the Doha Round, has staggered between failures, flops, and false dawns since it was launched in 2001. But the Doha logjam has not inhibited tariff liberalization far from it. During the last 15 years, most WTO members have massively lowered barriers to tr ade, investment, and services bilaterally, regionally, and unilaterally—indeed, everywhere except through the WTO. For today's offshoring-linked international commerce, the trade rules that matter are less about tariffs and more about protection of investments and intellectual property, along with legal and regulatory steps to assure that the two-way flows of goods, services, investment, and people will not be impeded. It's possible to imagine a hypothetical WTO that would incorporate these rules. But the most likely outcome for the future governance of international trade is a two-pillar structure in which the WTO continues to govern with its 1994-era rules while the new rules for international production networks are set by a decentralized process of sometimes overlapping and inconsistent mega-regional agreements. Scientists believe significant climate change is unavoidable without a drastic reduction in the emissions of greenhouse gases from the combustion of fossil fuels. However, few countries have implemented comprehensive policies that price this externality or devote serious resources to developing low-carbon energy sources. In many respects, the world is betting that we will greatly reduce the use of fossil fuels because we will run out of inexpensive fossil fuels (there will be decreases in supply) and/or technological advances will lead to the discovery of less-expensive low-carbon technologies (there will be decreases in demand). The historical record indicates that the supply of fossil fuels has consistently increased over time and that their relative price advantage over low-carbon energy sources has not declined substantially over time. Without robust efforts to correct the market failures around greenhouse gases, relying on supply and/or demand forces to limit greenhouse gas emissions is relying heavily on hope. It has been 40 years since the oil crisis of 1973/74. This crisis has been one of the defining economic events of the 1970s and has shaped how many economists think about oil price shocks. In recent years, a large literature on the economic determinants of oil price fluctuations has emerged. Drawing on this literature, we first provide an overview of the causes of all major oil price fluctuations between 1973 and 2014. We then discuss why oil price fluctuations remain difficult to predict, despite economists' improved understanding of oil markets. Unexpected oil price fluctuations are commonly referred to as oil price shocks. We document that, in practice, consumers, policymakers, financial market participants, and economists may have different oil price expectations, and that, what may be surprising to some, need not be equally surprising to others. Developing economies have found it hard to use natural resource wealth to improve their economic performance. Utilizing resource endowments is a multistage economic and political problem that requires private investment to discover and extract the resource, fiscal regimes to capture revenue, judicious spending and investment decisions, and policies to manage volatility and mitigate adverse impacts on the rest of the economy. Experience is mixed, with some successes (such as Botswana and Malaysia) and more failures. This paper reviews the challenges that are faced in successfully managing resource wealth, the evidence on country performance, and the reasons for disappointing results. Many of the insights of economics seem to be qualitative, with many fewer reliable quantitative laws. However a series of power laws in economics do count as true and nontrivial quantitative laws—and they are not only established empirically, but also understood theoretically. I will start by providing several illustrations of empirical power laws having to do with patterns involving cities, firms, and the stock market. I summarize some of the theoretical explanations that have been proposed. I suggest that power laws help us explain many economic phenomena, including aggregate economic fluctuations. I hope to clarify why power laws are so special, and to demonstrate their utility. In conclusion, I list some power-law-related economic enigmas that demand further exploration. Roland Fryer is an extraordinary applied microeconomist whose research output related to racial inequality, the US racial achievement gap, and the design and evaluation of educational policies make him a worthy recipient of the 2015 John Bates Clark Medal. I will divide this survey of Roland's research into five categories: the racial achievement gap, education policies and reforms, economics of social interactions, the economics of discrimination and anti-discrimination policies, and further topics involving the black-white racial divide. 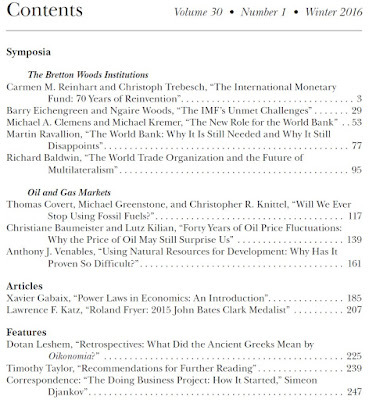 Nearly every economist has at some point in the standard coursework been exposed to a brief explanation that the origin of the word "economy" can be traced back to the Greek wordoikonomia, which in turn is composed of two words: oikos, which is usually translated as "household"; and nemein, which is best translated as "management and dispensation." Thus, the cursory story usually goes, the term oikonomia referred to "household management", and while this was in some loose way linked to the idea of budgeting, it has little or no relevance to contemporary economics. This article introduces in more detail what the ancient Greek philosophers meant by "oikonomia." It begins with a short history of the word. It then explores some of the key elements of oikonomia, while offering some comparisons and contrasts with modern economic thought. For example, both Ancient Greek oikonomia and contemporary economics study human behavior as a relationship between ends and means which have alternative uses. However, while both approaches hold that the rationality of any economic action is dependent on the frugal use of means, contemporary economics is largely neutral between ends, while in ancient economic theory, an action is considered economically rational only when taken towards a praiseworthy end. Moreover, the ancient philosophers had a distinct view of what constituted such an end—specifically, acting as a philosopher or as an active participant in the life of the city-state.